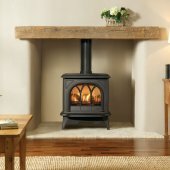 H McGregor - Great little stove and simple to use. The remote control is a lovely useful extra. A favoured stove in the Gazco range, the Huntingdon 30 gas stove successfully combines discerned styling with efficient heating technology. 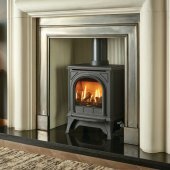 The Huntingdon 30 gas stove is available in a choice of three high quality colours including Matt Black and Matt Ivory. This authentic gas stove also features either a graceful tracery window or clear door for optimum flame viewing pleasure, giving great warmth and style to any interior. Choose from either realistic coal or log fuel effects, the latter sporting a glowing ember bed feature for the ultimate real fire effect. 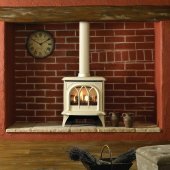 Both fuel effects are available in conventional flue versions, whilst the balanced flue model is only available with the log fuel bed effect. The Huntingdon 30 gas stove comes with manual control or, for total ease and convenience, upgrade to one of Gazcos remote controls. Fully manual operation of the fire. Pilot light is button ignited and shut down. The Standard remote control allows you to ignite your fire, choose between different flame settings and heat outputs, from the comfort of your sofa. The Programmable Thermostatic remote control allows remote operation of everything from ignition to extinguish as well as incorporating the benefits of a programmable timer and thermostat. It is important to understand that installation of any gas appliance needs to be done by a registered gas safe engineer. You can find a gas safe engineer near you by visiting the UK gas safe registry. Find an engineer now. H McGregor Great little stove and simple to use. The remote control is a lovely useful extra. Fred H Wonderful fire, was just what I was looking for. Kerry F Gorgeous fire, the ivory finish really bought my room to life.